Naqshbandiya Foundation for Islamic Education: Sons and Grandsons of Hazrat Ahmad Sirhindi r.a. The sons and grandsons of Hazrat Shaykh Ahmad Sirhindi, aka Imam Rabbani and Mujaddid Alf-e-Sani (d. 1034 AH) were all great scholars, Sufi masters and Awliya of the highest status. Here I am presenting a short genealogy of those great saints of the Muslim Ummah who have been shadowed by the history. Insha Allah short biographies of each one of them will also be produced in order to shed light on this noble family which brought Islamic revolution in India as well as in the whole world. 1.1 Khwājā Muhammad Sādiq Fārūqī Sirhindī, 1000-1025 AH, buried in Sirhind, India. Khilāfat from Imam Rabbani (1). Died in a plague during the life of his father. 1.3 Khwājā Muhammad Ma’sūm Fārūqī Sirhindī, 1007-1079 AH, buried in Sirhind, India. Khilāfat from his father Imam Rabbani (1). Successor to his father. Spiritual master of Mughal emperor Aurangzeb. 1.4 Muhammad Īsā Fārūqī Sirhindī, died in childhood in 1024 AH in plague. 1.5 Muhammad Farrukh Fārūqī Sirhindī, died in childhood in 1024 AH in plague. 1.2.3 Shaykh Muhammad Farrukh Sirhindī, 1038-1121 AH, buried in Sirhind. He was a great Islamic scholar, author and annotator. Mughal emperor Aurangzeb learned Sahih al-Bukhari from him. 1.2.4 Shaykh Abdul Ahad Wahdat Sirhindī, alias Shāh Gul, 1050-1127 AH, buried in Sirhind. He was a great poet and author of about 40 books some of which are published. 1.3.1 Shaykh Muhammad Sibghatullāh Sirhindī, 1033-1122 AH, buried in Sirhind, India. 1.3.2 Hujjatullāh Shaykh Muhammad Naqshband Sirhindī, 1034-1115 AH, buried in Sirhind, India. 1.3.6 Khwaja Muhammad Siddīq Sirhindi, 1059-1131 AH, buried in Sirhind, India. Hazrat Khadījā was the daughter of Imam Rabbani (the other daughter died in childhood) and was married to Shaykh Abdul Qādir Fārūqī who was a Qādi of Sirhind and a close relative. 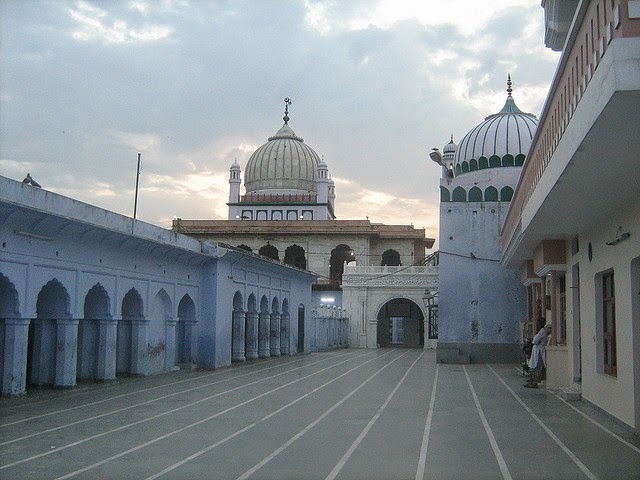 1.3.1.2 Shaykh Muhammad Ismāīl Sirhindi, d. 1136 AH, buried in Sirhind. 1.3.2.1.1 Khwājā Muhammad Zubair Sirhindi son of Shaykh Abul A’lā son of Khwājā Muhammad Naqshband, 1093-1152 AH. Khilāfat from his grandfather (1.3.2). He was the forth Qayyūm and one of the greatest shaykhs of the Mujaddidi order. Lived in Delhi and was buried in Sirhind. 1.3.1.2.1 Shaykh Ghulam Muhammad Ma’sūm Sirhindi, d. 1161 AH, buried in Sirhind. 1.3.1.2.1.7 Shah Safiyyullāh Mujaddidi Kābuli Sirhindi, 1156-1212 AH, acclaimed to be a Qayyum whose silsilah is still active with large number of followers. Lived in Kabul (Afghanistan). Khilafat from his elder brother Shah Ghulam Muhammad Sirhindi. 1.3.5.4.1.1.1 Shah Abu Saeed Mujaddidi, 1196-1250 AH, khalifa of Shah Ghulam Ali Dehlavi. Founder of one of the biggest branches of Mujaddidi order. Buried in Khānqāh Mazhariyāh, Delhi. 1.3.5.4.1.1.1.1 Shah Ahmad Saeed Mujaddidi (1217-1277 AH) son of Shah Abu Saeed Mujaddidi, also a khalifa of Shah Ghualm Ali Dehlavi and a well known shaykh and scholar, migrated to Madinah and is buried in Jannat ul-Baqī. There were hundreds of great scholars and shaykhs from the descendants of Imam Rabbani and it is not possible to enlist them all here. Only the important and well known names are listed.